This page covers the author of The Dilbert Principle: A Cubicle's-Eye View of Bosses, Meetings, Management Fads & Other Workplace Afflictions. For other authors named Scott Adams, see the disambiguation page. Adams is trained as a hypnotist and is a vegetarian. He is the creator of the Dilbert comic strip and the author of several nonfiction works of satire and commentary and business and general speculation. 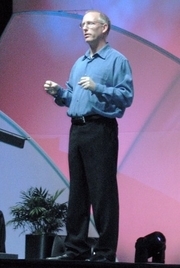 "Scott Adams" is composed of at least 4 distinct authors, divided by their works. You can edit the division. Scott Adams is composed of 3 names. You can examine and separate out names.